People have been settling along the Elbe since the dawn of history. Each generation has made their mark on the land next to the river. Over the centuries, imposing fortresses have been erected alongside impressive castles and magnificent churches. Trade has also been important, and has let many towns make their fortunes. 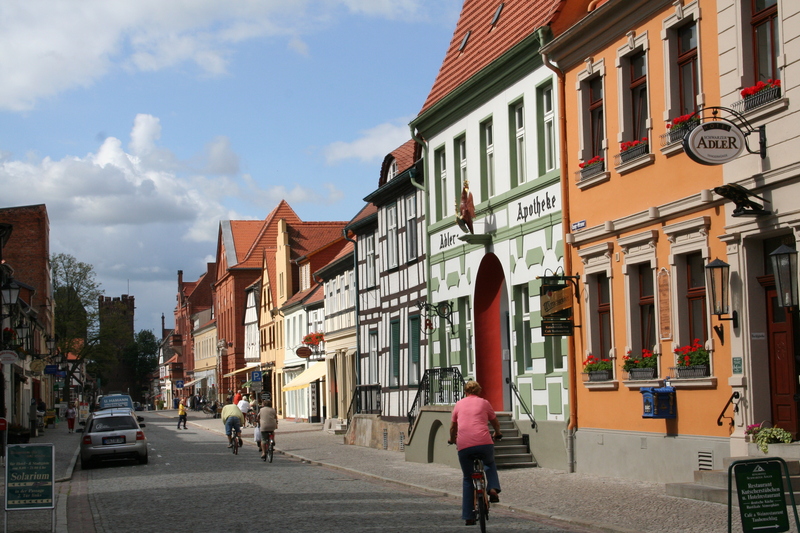 Magnificent half-timbered houses and well-kept town centres are a testament to local history. Just cycling? That would be so boring. The best thing about the Elberadweg is that you don’t have to sit in the saddle all day long. There are so many opportunities to hop off your bike and take the time to discover your surroundings. Variety is the spice of life. If you want to step back through time to when the great Emperors and Empresses like Otto the Great or Kaiser Karl IV, and princes like Augustus the Strong and his descendants were collecting paintings and riches from all around the world, we recommend a visit to one of the many local museums and galleries. As well as large, well-established museums, there are also plenty of small, quirky discoveries to be made, like the clock museum or the Museum of Lies. Our tip for cyclists travelling with baggage that would like to visit a museum: ask at the ticket desk if they would be able to look after your bags for you during your visit. "Whether it’s been decades or weeks since you left school - there are plenty of places all along the Elbe where you can learn a thing or two about history. The difference: no dry theory, but carefully designed exhibitions or strolls through historical town centres that let you experience history up close and personal. The history of the Reformation was written in a range of places along the Elbe. The best example is the Lutheran city of Wittenberg, home of Martin Luther and centre of the Reformation. Torgau and Mühlberg also played an important role. Hanseatic cities were the precursors to keen cross-regional trade, foreshadowing the EU. 24 Hanseatic cities still exist today. Some are smaller, some are world-renowned, and some are located along the Elbe. These include Prague, Hradec Kralove and Melnik. The royal cities of the Czech Republic once had special rights, and could not be sold or mortgaged against by the ruler. These developed into rich and privileged places whose glory days can still be felt when visiting. Our tip if you want to join in: book your accommodation well in advance. Celebrations are for celebrating, and there’s always a good reason along the Elbe. Town festivals, wine festivals, Medieval festivals, blossom festivals - they all attract visitors from near and far.